With most of the heavy lifting done and only one match left to play Saturday, Cory Rutkowski did what every red-blooded potential state champion should do before the biggest match of his tennis career. "That's just like Cory to do that," said his mixed doubles partner of two years, fellow Wood River High School senior Whitney DeBree. "But Cory is really fun. He never gets angry and he's the rock of the team. He just keeps me focused." All-around athlete Rutkowski doesn't get riled up about much, whether the Pac Ten college placekicking recruit is lining up a 40-yard field goal on the gridiron or pulling down a tough rebound on the basketball court or wearing down an opponent with ground strokes. A stickler for accuracy, he's well matched with DeBree—not only because of their reddish hair. 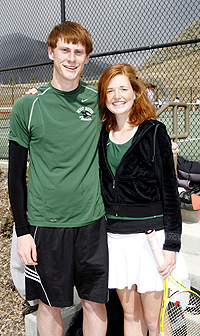 Rutkowski said about his partner after Saturday's mixed doubles championship match of the State 4A tennis tournament in Caldwell, "She gets me fired up and makes tennis fun." And it was a lot of fun for Rutkowski and DeBree at Caldwell, where they blew away four opponents in straight sets and won Wood River High School's first state championship at the tougher 4A level—dropping only nine games in four triumphs. They beat Century's Chester Kener and Krystle Maples 6-2, 6-3 in the championship—the fourth time this season that Rutkowski and DeBree have beaten the Century pair. And the win capped an undefeated season for the Wood River seniors in district and state play. It was Wood River's first state title since 2004, and the first mixed doubles win since Whitney's older sister Hadley paired up with Dixon Mooseau to capture the 3A title in 2003. Wolverine head coach Vicki Johnston said with a smile after the big victory, "When I grow up I want to be just like Cory and Whitney. No, really, they're leaders in school and on the court and have great attitudes. Every match they want to improve. Most of all they want to go out and have fun." After winning four of their five state matches last May on the same Caldwell courts to place third—losing only to the eventual state champions—Rutkowski and DeBree had a clear objective for 2007. Really, no mixed messages at all. Second-year coach Johnston said, "They gained a lot of confidence last year and started the season knowing they had a chance to be state champions." Rutkowski added, "In the back of our minds we wanted to make it back to state and win the championship." Just before the two-day, 17-school 4A tennis tournament staged Friday and Saturday, DeBree said, "We wanted it real bad. We said, we're seniors, let's do it." They won their first three matches with 6-0 masterworks in the second sets. They actually gave up five games in the championship, but Rutkowski was leaving no margin for error. The final point was pure Rutkowski hustle, showing the dream duo's determination. "Cory never doubted the point. It showed just how they never gave up," said Johnston. The coach added, "The thing about doubles is you have to be consistent. You want to end the match as quickly as possible. They did that, executing their shots as well as they could." From their experience playing the Century pair, Rutkowski and DeBree knew how to operate in the title match. DeBree said about Century, "They're tough, tennis wise. We knew we had to keep them from getting into a groove." Rutkowski and DeBree were a great example for the rest of the tennis team this spring because they worked so hard to improve, Johnston said. "Cory improved a lot in his confidence and net play. His accuracy in serving is amazing. He doesn't serve hard, but he throws people off with his second serve. I don't ever remember him double-faulting. Cory is just a very smart player. He knows the importance of court coverage and views it as if they were playing chess out there." DeBree complements her partner well, Johnston said. "Whitney has such great fire and the desire to win and put the ball away. She's great serving and great in volleying and will run anything down with her determination," she said. Johnston said, "We'll miss them so much next year." The coach was proud of all seven Wood River state tournament players and had words of praise for sophomore singles player Tanya Greenwood, who posted her first state victory. She said, "Tanya had a great singles match. In fact, each match she improved her footwork and placed shots better and hit the ball a little harder." Wolverine girls' doubles players Kira Gardner and Tessa Barrow won two of their fourth matches at state. 1—Bishop Kelly of Boise (15) 90 points—8th state title in 10 years, 17th overall. 2—Hillcrest of Idaho Falls (17) 81 points. 3—Century of Pocatello (6) 38 points. 6—Wood River (7) 24 points. Bishop Kelly (90)—20 BS, 16 GS, 28 BD, 22 GD, 4 MD. Placements: 1st—BS, GD, MD. 2nd—GS, BD. 3rd—BD. Hillcrest (81)—16 BS, 23 GS, 11 BD, 28 GD, 3 MD=81. Placements: 1st—GS. 2nd—GD. 3rd—BS, GD. 4th—BD. Century (38)—12 BS, 10 GS, 0 BD, 0 GD, 16 MD. Placements: 1st—none. 2nd—MD. Wood River (24)—0 BS, 1 GS, 0 BD, 3 GD, 20 MD. Placements: 1st—MD.